Peru is familiar yet mysterious. Bolivia is unknown yet captivating. Together, they’re something close to magical. See for yourself on this entrancing journey into the land of the once-powerful Inca, a realm of unforgettable landscapes, dazzling culture, and potent cuisine set against the stunning backdrop of the mighty Andes. It begins in Lima, capital of Peru, where you’ll explore the lively city and tour the impressive Museo Nacional de Arqueología, Antropología e Historia del Perú. Later, learn the secrets of the local cuisine via a hands-on cooking class with local chefs. After catching a flight to Cusco, you’ll be taken into the heart of the Sacred Valley for an unforgettable encounter in this historic land, highlighted by a pair of private guided tours to Machu Picchu, the fabled “Lost City of the Inca.” Later, head south to the shores of Lake Titicaca, the spiritual homeland of the Inca. By private speedboat, you’ll learn about life on the vast lake through visits to the islands of Uros and Taquile. Next, cross the border into Bolivia by way of the lake, then relax on a private drive to the mountain-side city of in La Paz, Bolivia’s administrative capital. In this high-altitude city 11,942 feet (3,640 meters) above sea level, you’ll discover the city’s famous Mercado de los Brujos (Witches’ Market) and hike through the lunar landscapes of Valle de la Luna (“Valley of the Moon”) before exploring the mysterious ruins of ancient Tiwanaku on privately guided excursions. Last stop: the stunning salt flats of Salar de Uyuni. You’ll take a guided tour of Bolivia’s signature natural attraction with the help of a skilled guide who will bring the fascinating region to life. (Be sure to stay up late and get up early to catch the majestic sunrises and sunsets.) Elsewhere in the Uyuni area, you’ll visit Isla Incahuasi (a rocky “island” in the middle of the sprawling sea of salt), and the macabre mummies of Coquesa that date back to 700 BCE. The archaelogocal capital of the Americas and the oldest continuously inhabited city on the continent, Cuzco is now an important line in the South American travel network. Its legacy as the hub of the Inca empire is readily apparent; most of the city streets are lined with Inca-built stone walls and crowded with Quecha-speaking descendants of the Incas. The city has magnificent repositories of colonial art such as the cathedral (begun in 1559) and La Merced Church. There is also the Coricancha ruins, east of the city centre, which were formerly covered with gold (the stonework is all that remains) and the Museo de Arqueologia, the interior of which is fulled with metal and gold work, jewellery, pottery, textiles and mummies. For other ruins – Sacsayhuaman, Qenko, Puca Pucara and Tambo Machay are nearby. It is confusing, but Bolivia has two capitals: La Paz is the administrative capital and Sucre, where the document of independence from Spain was signed in 1825, is the constitutional capital. the airport, appropriately named “El Alto” (meaning “high”) is 12,700 feet above sea level. La Paz is a little lower, at 11,880 feet. La Paz has its modern side, with good hotels, office complexes and good restaurants, but go to the market area and you’re transported back in time a few hundred years. 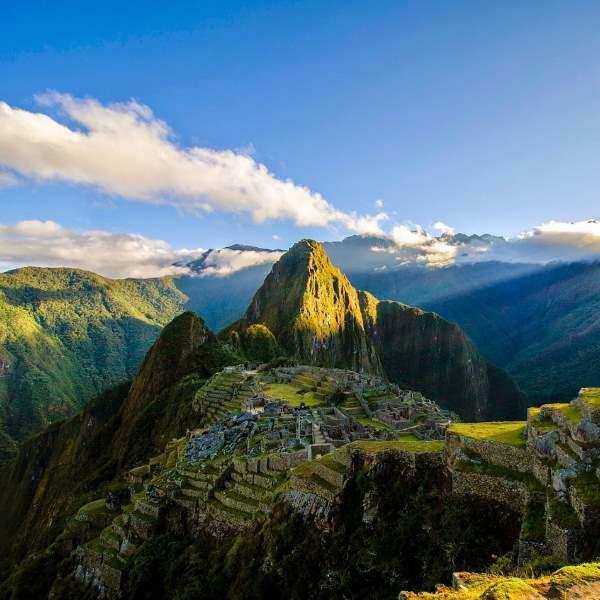 Machu Picchu is the best-known and most spectacular site on the continent. The ‘Lost City of the Incas’ still retains an air of grandeur and mystery and is a ‘must see’ for any visitor to Peru. Puno is located on Lake Titicaca.